Graham crackers are great for s'mores, pie crusts, and just for snacking. 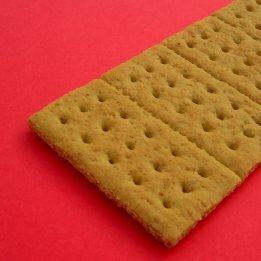 Making your own graham crackers allows you to make crackers that are superior to store bought ones. This page contains homemade graham cracker recipes. Cut the dough in half and let it sit for 15 minutes at room temperature. Sprinkle a piece of wax paper with whole wheat flour. Roll out one of the dough pieces flat to about 7x15 inches. If the dough cracks or breaks, just pinch the edges back together. Poke a fork into the dough at 1/2 to 1" intervals. Then cut into 2 1/2 inch squares. use a spatula to move the squares to a large, ungreased baking sheet. You can place them close together. Repeat with the other half of the dough. Bake in the center of the oven for 15 minutes at 350 degrees F. or until lightly browned on the edges. Store at room temperature in an airtight container. They should last up to a month. For a sweeter treat: sprinkle a mixture of sugar and cinnamon over the top.